The documentary film Anatomy of Protest 2, which recently aired on Russian television, has sparked controversy around opposition leaders. The Russian television channel NTV has accused the opposition of preparing to use illegal force, while opposition leaders have promised to file lawsuits against defamation. Russia’s opposition has once again found itself at the center of a television storm. Anatomy of Protest 2, which aired on NTV in early October, has caused an even greater stir than the first part of the documentary. While "Anatomy of Protest" maintains that the Russian opposition and anti-government rallies are sponsored and financed by the West, then the follow-up film goes much further by making accusations that fall under several articles of Russia’s Criminal Code. The documentary itself is currently available on YouTube.The main controversy broke out around accusations against Left Front leader Sergei Udaltsov. The film’s producers claim to have hidden camera footage that shows the opposition leader talking, in the presence of fellow activists, to an “emissary of the Saakashvili regime” about overturning the Russian system of government – employing a range of illegal methods that include neo-Nazi troops, Chechen terrorists and a seizure of power in Kaliningrad. “An action plan has already been mapped out, and its masterminds are outside Russia,” an off-screen voice stated in the film. The video has already captured the attention not only of politicians and the Public Chamber but also the General Prosecutor’s Office and the Investigative Committee, which announced on Oct. 6 that it would be launching an inquiry into the allegations. “In my view, the array of criminal activities covered by the film poses a serious threat to the public and jeopardizes the lives of Russians – especially when it comes to possible terror attacks. And the fact that the documentary contains details on who is sponsoring these activities, as well as the exact amounts of financing, makes it clear that it is all organized,” Chairperson of the State Duma security committee Irina Yarovaya said in a live interview with Kommersant FM. Yarovaya dismisses the idea that the TV channel could have used fabricated data and that the film itself was propaganda. “How on earth can it be propaganda? We saw videotaped conversations involving certain well-known people conspiring to commit crimes,” Yarovaya said. State Duma deputy Vladimir Burmatov shares this opinion. “I believe they made a very honest and sincere movie, confirmed by the outcry from the opposition. It’s hysterical. We have a proverbial saying: ‘The truth tastes bitter,’” he said. Meanwhile, the opposition contends that the accusations are completely unfounded, and that the tape had been commissioned. “Even the worst possible journalists could not have produced such nonsense. I specifically checked who is behind the documentary. It turns out that it was put together by guest journalists in no way linked to NTV. The TV channel hires teams of journalists for single projects. We may even respond with an Anatomy of Lies film,” said Dmitry Gudkov, a State Duma deputy in the opposition. Almost all opposition “characters” featured in the documentary have accused NTV of lying, even urging Udaltsov to sue the channel. “The film itself is fairly mediocre and defamatory. If I was Udaltsov, I would sue them for defamation,” Boris Nemtsov, co-founder of the PARNAS opposition party, said. According to RBC Daily, the “hidden camera footage” is indeed dubious. For instance, unlike the documentary’s lead character, Sergei Udaltsov does not smoke and has a better understanding of the balance of power within the opposition forces. 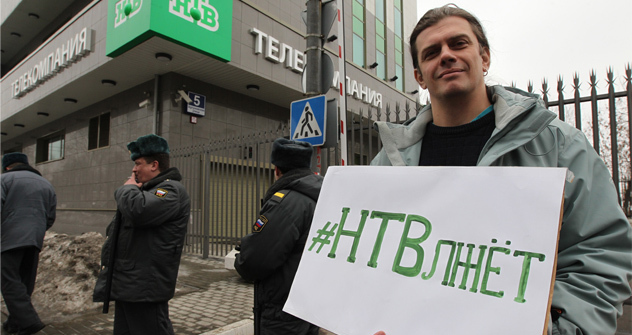 The newspaper also questions the claim that “the Russian nationalists movement is financing trade unions with the money of fugitive oligarchs.” Internet users have also been commenting on other inconsistencies in "Anatomy of Protest 2." Even the NTV staff is split over the film, RBC Daily reports. According to a source familiar with the situation on the channel, a number of NTV journalists are unhappy about the documentaries “exposing” the opposition. Many public figures refused to have any contact with NTV after the first film was aired, and some aggressive incidents even made a training session on how to film rallies necessary for journalists. The article is based on the materials from RBC Daily and Kommersant FM. "I believe they made a very honest and sincere movie, confirmed by the outcry from the opposition. It’s hysterical. We have a proverbial saying: “The truth tastes bitter.” And once again, truthful facts have been disclosed about all of them, including this Udaltsov person. Naturally enough, such truth does not feel good. Obviously they did not expect all those conversations, absolutely repugnant and contemptuous of the state’s interests, to become public at any point in time." "The point of the documentary was to sow discord within the opposition forces by effectively accusing Udaltsov of state treason and demanding an official investigation into the matter. Now, if the opposition does not show solidarity in its support for Udaltsov, or even if leaders of Russia’s radical opposition adopt some revolution strategy against him, the Kremlin’s move will hit home."